A project led by the Canadian Mental Health Association, Ontario, Dietitians of Canada, and Kwantlen Polytechnic University to disseminate findings from a national consultation on research priorities and to guide collaborative research and knowledge exchange activities across the nutrition and mental health sectors. In 2014 the project partners conducted a national consultation to identify and prioritize research topics in nutrition and mental health. In phase two (2016-2017), the project team is engaging with nutrition and mental health stakeholders to facilitate cross-sector research collaborations. For more information, visit www.nutritionandmentalhealth.ca. Although nutrition and mental health is becoming an area of increasing investigative interest, no specific research agendas to help guide research, policy, and practice currently exist. Based on evidence that mixed approaches that engage diverse stakeholders with an experiential understanding of the nutrition and mental health system generate meaningful action plans, an integrated, citizen-engaged research agenda-setting project, Dietitians and Community Mental Health: Setting the Research Agenda, was conducted from 2013 to 2014. 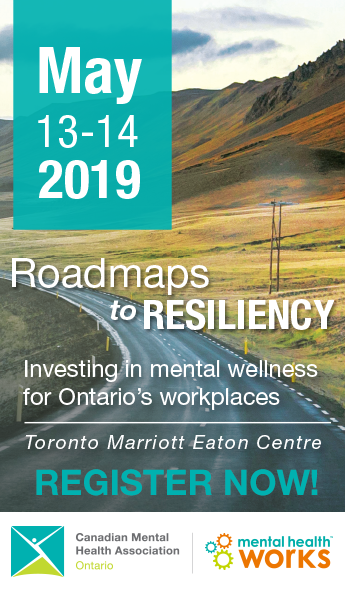 This national initiative was a collaborative effort of Dietitians of Canada (DC), Canadian Mental Health Association Ontario, and the University of British Columbia, with funding from the Canadian Institutes of Health Research (CIHR). The consultation process engaged researchers, policymakers, service providers, persons with lived experience of mental illness and/or family members of persons living with mental health conditions. 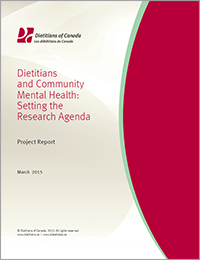 The end result was the formulation of a Canadian nutrition and mental health research agenda ultimately aimed at the optimization of nutrition and mental health services in community settings.